In business, you have to position yourself where the consumer is; you have to be where they are, the consumer must be able to access your content and services with consummate ease. So where is the consumer? What method or platform can you use to reach them at their convenience? What is the one item the consumer will most likely have with them all times? I think you know the answer, that’s right, their smartphone. The smartphone is rarely out with the consumers grasp for any sustained period of time, so what better platform than the phone that resides in their pockets and handbags to deliver your message? Connected mobile devices have changed the approach within marketing, in the same way that you wouldn’t think of running your company without a website; the same adage is now applied to mobile apps. So, you may ask, why do I need mobile app? Mobile apps extend your businesses reach beyond the internet and into the consumers pocket and handbags, quite literally! With an app the consumer doesn’t have to log into their computers or search the web to obtain your information, with an app all the information they will need on your business will be in a handy, one click application. The app is the new website. This is no passing fad or trend, it is estimated that over 1 in 3 visitors to your site will do so through mobile means, an optimal mobile experience is crucial to companies across the board in a world where connected mobile devices is now more the norm rather than the exception. It is your responsibility to engage the smartphone generation, you are not alone in this conquest, this is an extremely competitive market. Many people have the same idea, which is the basis of today’s blog. 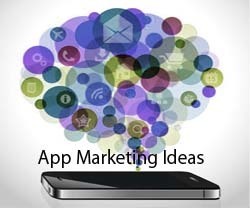 How do you differentiate your app from the plethora of options out there and critically, how do you market your app? The following are a few pointers to aid you on your way. Regardless of how well you market your app, if it’s not something that people will find useful or they need then they simply won’t use it, have a concrete purpose for your app in mind before you press on any further. This one seems obvious but the consumer should understand from the very first sentence what it is you app actually does, your goal is to entice the consumer so they feel compelled to read more about its description and ultimately start using your app. Keywords will let the consumer know exactly what your product is about; this is how your app will be found. Think it over carefully. Consider use keywords that are not common so as to differentiate your app when consumers are searching app stores and similar areas. If consumers have found your mobile website then they are prime candidates for your app, use this fact and make the transition as seamless as possible for them. Make sure the information relating to your app is in a prominent position and not hidden away at the foot of the page. What is your niche? Where is your market? Where can they be found? Target these areas. Consider using social media to target specific demographics and interests. Consumers have been shown to react positively to visual engagement, include exciting, dynamic screenshots of your app outlining what it does and how it looks, use all the slots available to you, don’t let any go to waste. The internet is widely expected to adopt video viewing sharing in a big way this year, use this to your advantage, create a video which will visually engage the consumer, you can add this resources to youtube and your blog. Premium quality content is high on the consumers list; they will actively search for content that helps them with any questions or conundrums they may have, blog regularly about these topics, by doing so you will attract traffic to your site. Assemble regular blogs about your app in this way also. No matter what correspondence it may be, include a brief description of your app along with a link to it, you are most likely sending emails every day; use this to your advantage and ensure everyone within your company dopes the same. You want to maximize your apps visibility and provide the shelf space it deserves, utilize the appropriate outlets. Is your business in need of a mobile app in today’s ultra-connected world? Try the free fully functional trial of 3D Issue today.